the terrific speed is indescribable. Up to now you had to go to Inje County, Gangwon Province or Yeongam County, South Jeolla Province to enjoy car racing in Korea. Now though, you can experience thrilling speed, even in the metropolitan area. This is because Yongin Speedway near Everland has reopened after eight years of closure. This kind of breaking news can never go unnoticed. 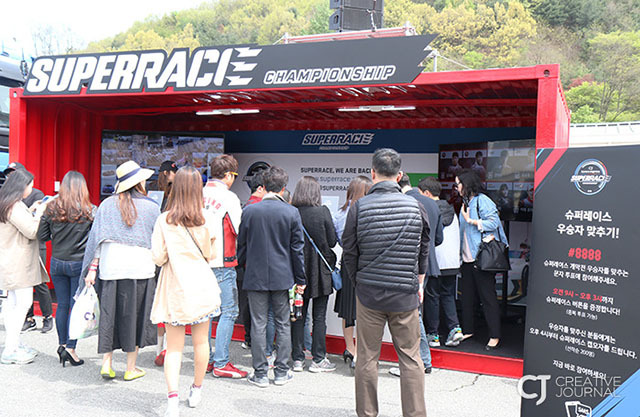 CJ Creative Journal attended CJ Logistics SuperRace Championship 2016 (CJ SuperRace) held in Yongin Speedway on April 23 and 24. Let’s take a look at CJ SuperRace filled with the passion and enthusiasm of fans and drivers as fervent as the roaring engines. CJ Logistics SuperRace Championship 2016 featured tours of Korea, China and Japan with a total of eight rounds. The curtain on the magnificent car racing event has gone up at Yongin Speedway. The concept of the opening event was "We Are Back," celebrating the new season, the beginning of the Yongin era, and the prelude of the age of Korean motor sports 2.0. Yongin Speedway, which is now greeting fans again, is historically significant as it was Korea's first racing circuit. The news that it had reopened after its closure in 2008 due to circuit maintenance was welcomed by both drivers and fans alike! Fans have waited for the opening of Yongin Speedway with great expectation because it’s the only circuit in the metropolitan area. ▲ About 13,000 people visited the CJ Super Race! On April 24, 2016, the hot weather seemed to announce that summer had come early this year. When we arrived at the scene, numerous fans were already enjoying the CJ SuperRace. About 13,000 people of all ages visited to watch the SuperRace on this day. Before the start of the opening race, we visited an event hall at which various programs had been prepared. What caught our eyes first were the long lines around booths! We moved instinctively towards the longest line. We first went to the XTM’s "Top Gear" and "The Bunker" booths. SuperRace Assetto Corsa Championship 2016 took place at the Top Gear booth. It was a simulator game in a tournament format, following the format of the CJ SuperRace. We were able to meet quite a few hidden masters. All were breathless with excitement as they drove the "cars". ▲ "You have 10 seconds left!" What is the finishing record of fit-in? A tire change event took place at The Bunker Booth. We experienced the "fit-in" process in person in which the tires of a racing car are replaced speedily and safely. The appearance of a racing mechanic added an extra touch of realism. The Reaction Test appealed to fans' desire to win. The test is one of the ways F1 drivers work on improving their reaction times. It seemed easy when watching in the line, but looks can be deceiving! ▲ Photo time with Popcorni! ▲ Guess who will be the winner of CJ SuperRace! ▲ Which team are you rooting for? There were also many event booths, including a roulette game, a "photo time with Popcorni" which gave out CGV’s popcorn for free, and a "tattoo sticker event" to mark the 10th anniversary of tvN. The "photo time with Popcorni" was an event where you had to find Popcorni going around the event hall, take a picture with him, and upload the photo on social media to receive CGV popcorn. Even a woman in her 50s completed the mission successfully and received her popcorn. Racing girls are one of the highlights of car racing. As soon as they posed next to a splendid racing car, they were photographed in a flood of flashlights. Unexpectedly, many families came to watch the car racing, with children particularly enjoying the entertainment on offer at the Kids Zone booth. Most popular was the Kids Racing School where they could experience driving and receive safety training. They also received a stock car paper toy which they could get by uploading a family photo at the event hall on social media! Thanks to the variety of programs for kids, parents were able to relax and enjoy the SuperRace. Finally, the long-awaited event arrived: the famous Grid Walk. Yet, before the Grid Walk, there was the Taxi Time. The Taxi Time refers to an event of getting in the racing car and experiencing racing with a driver on a real-life circuit. This is the best event for fans because they can experience the thrilling speed of racing. It ended with a lap of the circuit. Excitement and joy crossed the face of the participants getting out of the racing cars. Seeing this look on their faces, we felt sorry that we hadn't got our tickets for the event in advance. But it was okay, because the Grid Walk was waiting for us! The real highlight of racing was the Grid Walk. The grid is the starting line of a car-racing track. The Grid Walk involves walking on the grid and seeing racing cars, drivers and racing girls representing each team presented on the grid before your eyes. ▲ Grid Walk heated up with racing fans! There was already a very long line, even before the circuit gates opened. This is because the event gave fans a chance to look at the stock cars and speak with their favorite drivers. Thanks to the drivers posing for photos and talking with their fans, the atmosphere on the circuit was one of enthusiasm and excitement. ▲ Driver Kwon Bom-yi, a heroine of feminine power! As we carefully surveyed the grid, some familiar faces greeted our eyes! They were celebrity-turned-racers. We met drivers Ahn Jae-mo, Ryu Si-won, Kim Jin-pyo and even Han Min-gwan. We were very glad to see them on the grid. A few female racers met us as well. Driver Kwon Bom-yi and actress-turned-racer Lee Hwa-seon displayed their excellent skills on the circuit. The Grid Walk was over before we knew it. During the event, we had a wonderful time with the stock car drivers! Now, the opening race was just around the corner. Who would be the final hero of the opening game? The circuit scene from the Grid Walk was quite different from the circuit seen from the seats. The roaring engine sound just before the final was greeted by roaring fans. CJ Logistics SuperRace Championship 2016 featured seats to see the grid at a glance, and a large screen behind the event hall offering a broader view of the entire circuit. Fans cheered as the cars dashed away from the starting line. ▲ SK ZIC 6000 Class! Who would be the winner today? The final of the opening race took place on April 24. Four-class finals were held in sequence: Ecsta V720, SK ZIC 6000, GT, and Shell Helix Ultra 1600. Most popular among them was definitely the SK ZIC 6000 Class. There were in fact many interesting things that caught the eyes of fans who had waited for this opening drive. Especially remarkable were the stock cars, made exclusively for racing which can be seen only in Asia, and the fierce competition witnessed among the 22 racers, including world-class drivers from across the world such as Korea, Germany and Japan. ▲ The championship cup of the opening game went to driver Kim Dong-eun from Team CJ Logistics! After the breathtaking, thrilling racing, driver Kim Dong-eun won the championship title! He ranked first with an unbeatable 47 minutes 52 seconds 670, beating his rival Cho Hang-woo who was the champion for the 2014 season. This victory was particularly well cheered by CJ Logistics, sponsor of Kim Dong-eun’s Team CJ Logistics. In the GT1 Class, meanwhile, driver Lee Jae-woo of the Chevrolet Racing Team achieved "pole to finish," getting ahead of driver Kim Joong-gun of the Seohan Purple Motorsport Team and driver Choi Myeong-gil of the Solite Indigo Racing Team. In the GT2 Class, driver Han Min-gwan of the Seohan Purple Motorsport Team lifted the championship cup, giving fans a strong impression of his racing skills. See you again, CJ SuperRace! ▲ See you again, CJ SuperRace! CJ SuperRace has started on its big run of seven months and circuits of 12,000km! The Yongin Speedway marked the beginning of the CJ SuperRace. This opening race raised expectations for Yongin Speedway as well as CJ SuperRace. It was particularly impressive that this race was not just an event only for racing fans. The CJ SuperRace was a pleasant festival itself, including programs for kids, event booths, including some run by familiar CJ Group brands such as CGV. Does even hearing the roaring engine sound from the circuit make your heart race? The next racing events will be held in Yongin Speedway, Yeongam KIC, and Inje Speedium. Don't hesitate. Join the fun!